Download final report. 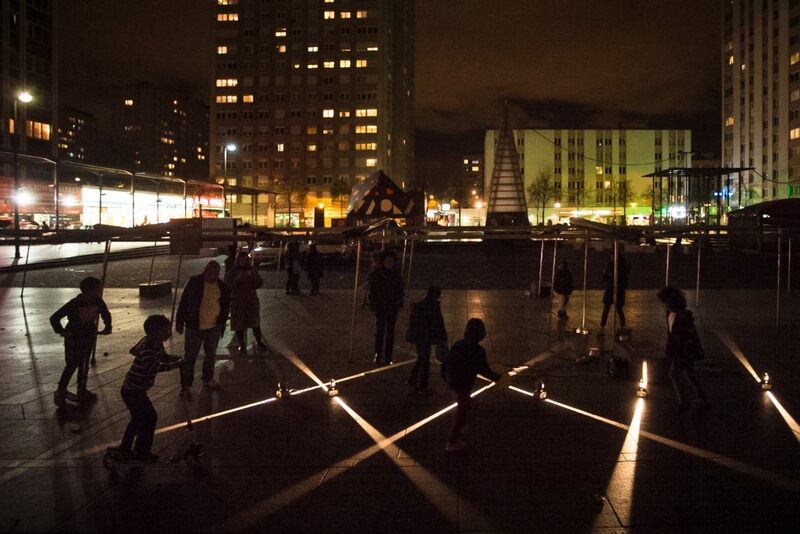 Details of Place des Fetes workshop in Social Lightscapes book. Places des Fetes is one of 14 public squares being redesigned by the Mairie de Paris. At the centre of a historic working class district of eastern Paris, the last bastion of the 1871 revolution and the site of many waves of immigration (and now gentrifying in-comers), Place des Fetes is both a lively multicultural space and at the same time the dilapidated fallout from several stages of modernist planning: high-rise social housing towers over both its centre and its surrounds. 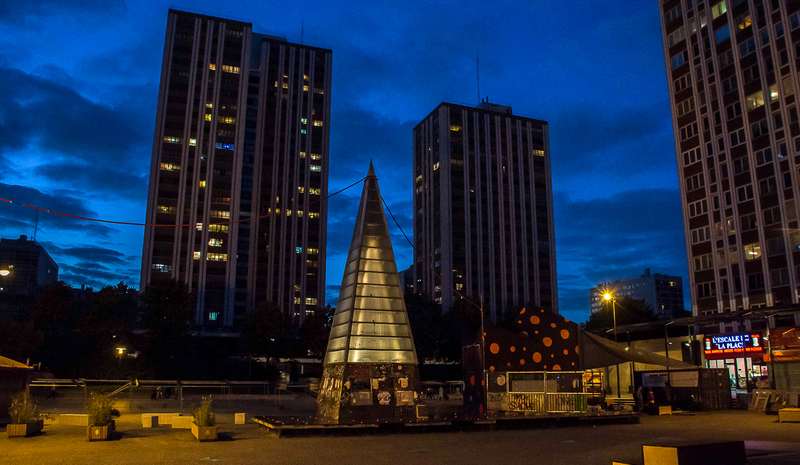 Following a ‘postmodern’ re-development in the 1980s, the Place des Fetes declined. More recently, it has been the focus of five years worth of public consultations, planning exercises and activation initiatives. Towards the end of this process, the Mairie recognized that little attention had been paid to the Place after dark, to its night-life or lighting. Configuring Light was commissioned to carry out intensive social research to understand who uses this space and how, to consider how the space is zoned through the practice of its diverse stakeholders, and to see what lighting could actually do. 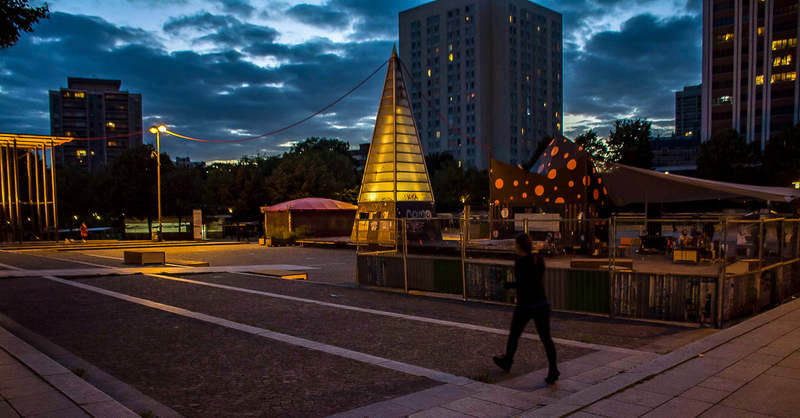 disrepair, broken lights and incoherent patchwork of installations sent a stronger message to citizens than any design could: bad lighting spoke volumes about social marginality. Maintenance should have as much weight as design. urban planners need to move beyond associating light with night: lighting Place des Fetes involved more complex temporalities than night/day. The crucial time for activating the space was the period between end of school and early evening. lighting based on purely spatial analysis can undermine people’s actual use of the space. For example, lighting that tried to make the Place into a ‘square’ (a space with a central focus) would entirely disrupt the ways in which important stakeholders zoned the space through their practices – crucial lines of sight cut across the classic design of a ‘public square’. This consultancy was followed up by a Social Lightscapes workshop in the Place des Fetes, which allowed us to involve 35 lighting designers in this research for a full week in October 2017. As result of both research and workshop, the Mairie de Paris invited us back to look at their lighting designs from the perspective of social research in February 2018.